Beware of basing personal decisions on the “average” case. Not everyone is “average”. Therefore, the ROI for a college degree must be based on personal circumstances, which can vary substantially. For instance, some college graduates take on enormous debt that should be figured into the college premium. The college premium is also highly dependent on field of study and on characteristics of the student. Most reports that claim to measure the value of a college degree do not control for a vital factor — the student. They fail to account for what Bryan Caplan calls the “ability bias“. This bias favors personal traits like intelligence, work ethic, and conformity — traits typically valued by selective schools as well as by employers seeking candidates for high-income jobs. On average, a hard-working computer science MIT graduate with a 130 IQ will bump up the average earnings for college graduates while a lackadaisical ethnic studies major with a 100 IQ who graduated from a directional state college will lover them. But even if neither attended college, the MIT-wannabee would still probably out-earn the second individual. Don’t forget to consider the other important factors, like college majors, costs, and individual ability, that lie hidden beneath the results. 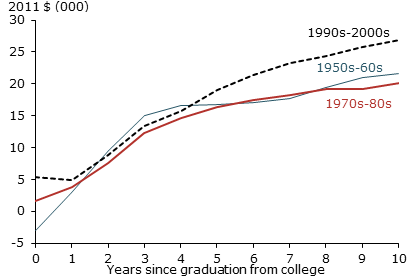 Mary C. Daly and Leila Bengali, “Is It Still Worth Going to College?”, Federal Reserve Bank of San Francisco Economic Letter, May 5, 2014.